How to Cook Everything has earned its recognition as a classic. It really is the best all-purpose cookbook for today’s new and beginner cooks. Even accomplished cooks will admit to referring to the tips, techniques and countless recipes on a most regular basis. The high praise on the dust jacket includes the names of such noted celebrity chefs as Mario Batali, Bobby Flay, Jean-George Vongerichten and Mollie Katzen. This 10 edition is much more than just a polishing and re-jacketing. The changes are extensive. 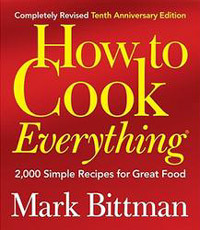 Mark Bittman has gone through every recipe and removed, updated and added where he felt it was needed. There are hundreds of new dishes. Here’s a great new feature; each chapter opens with a section of “Essential Recipes”, which are the building block recipes that every cook needs in their repertoire. This new edition reflects a growing interest in cooking with more whole grains, beans and vegetarian dishes, he even tags his vegetarian dishes for easy reference. Still here, and further expanded are his handy illustrations of the more complex techniques. As always the recipes are uncomplicated, unfussy and most can be prepared in under 30 minutes. He offers his great tips and suggestions for substituting ingredients, improvising and variations on a dish. There are also the classic, need to know dishes such as roasting Turkey and Beef that make this the book to go to for entertaining too. His charts such as “7 Vegetables and Stuffings to Match” also add the the already useful and flexible nature of this cookbook. Yes, I think Red is the new Yellow on my bookshelf. And, thank you Mark for including a much needed recipe for spaetzle in your new edition! how do you think it compares to joy of cooking? if you were to pick one which would u buy? thanks! Hi, I have both books. I tend to use How to Cook Everything more often, particularily to look up specific recipes or ideas for ingredients on hand. I use my Joy more out of nostalgia, when I want to cook something more old-fashioned that mom used to make (it is my grandmothers old copy after all). If you can afford to buy both do so, but if you want just one pick How to Cook – it is indespensible as a collection of recipes and how to info. I too have an old worn out version of this book. I can’t stop using it and until now have found it hard to get rid of. But now, thanks to your site, I just put in an order for a brand new copy. Great review. Hope you enjoy your new edition, I do! Does it really have things that Joy doesn’t? The detail and completeness of Joy can not be beat, can it? I made marizipan – or at least thought about it – the other day from Joy. And pickled carrots! Give me a real reason or recipe example to switch, please. I agree that it can be hard to choose between How to Cook Everything and Joy of Cooking. My impression from preliminary research is that How to Cook Everything is good for beginners, but unsatisfactory for experienced cooks. Those with more experience may prefer Joy of Cooking, or The Way to Cook by Julia Child, or The Best Recipe by Cook’s Illustrated. Those who prefer truly gourmet food may need The New York Times Cookbook by Craig Claiborne.